We first visited Chicago in 2015 for Taste of Chicago over 4th of July weekend. The trip was planned well before I knew I’d be pregnant with Kennedy and unfortunately traveling during my first trimester proved to be unpleasant. 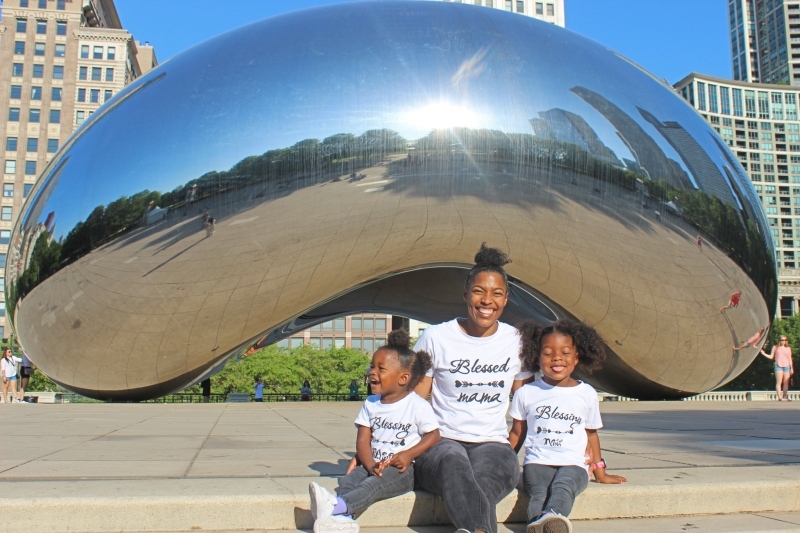 So we wanted to come back and here’s how we spent 3 days in Chicago with kids. Memorial Day known as the unofficial start of summer was the perfect 3-day weekend for a trip to Chicago. 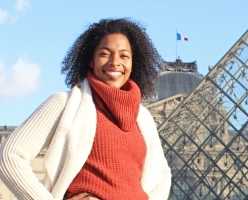 Traveling during holidays can sometimes be expensive but thanks to Spirit Airlines low fares we were able to snag a great deal which made our trip possible. Don’t sleep on Spirit; they have improved their on-time delivery status to 85% and both our flights landed on time or early. Our flight landed in Chicago at 8:30PM and we took the train from O’Hare to our hotel. We purchased a 3 day unlimited CTA card to get us around for the weekend. It’s $20 per card and kids under 7 are free with a paying adult. It’s the cheapest and most convenient way to get around the city. We stayed in Downtown Chicago just one block from Michigan Ave at the Raffaello Hotel. The location of the hotel is perfect for using public transportation and close to all the main attractions of the city. Within two blocks in every direction of the hotel were great restaurants for breakfast, lunch, and dinner. There is also a Walgreens down the street and many retail shops lines on Michigan Ave. If the weather is nice you can walk to the Navy Pier as well as The Bean, both are about a 20 minute walk. Chicago isn’t the cheapest city in the world but there are ways to save money. 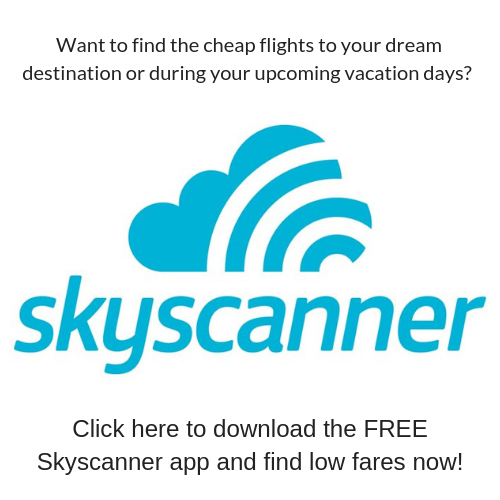 The best way to save money on attractions is Chicago is by purchasing the Chicago CityPass. It includes 5 major attractions, saving you up to 51% off the general admission. It also includes VIP entry into all of the attractions allowing you to skip the line. 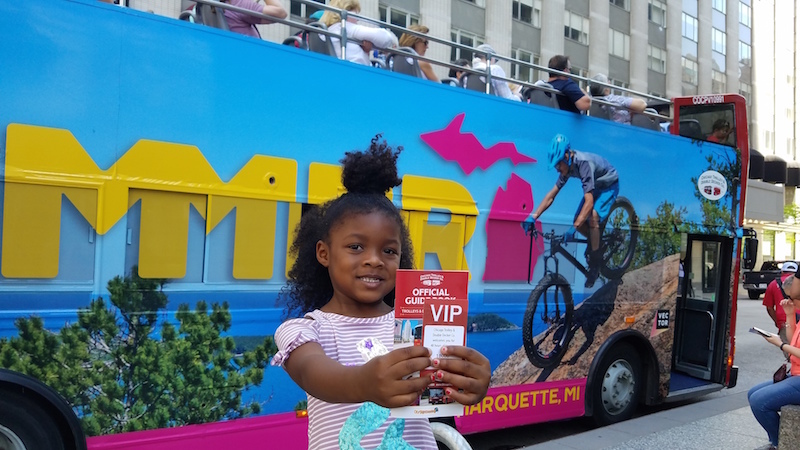 Included in the pass is the Shedd Aqauarium, Field Museum,Skydeck Chicago, 360 Chicago or Museum of Science & Industry, and the Adler Planetarium or Art Institute of Chicago. Our hotel was right next to 360 Chicago so we started our day there. It has some of the best views of the city, yes better than the Skydeck. 360 Chicago opens up at 9AM and we wanted to beat the crowds so we got there around 9:30AM and were happy we did. It’s known for the Tilt, a window of the building that you can lean on and it actually tilts forward so you can face the ground, 94 floors below. Watch Jordyn and James brave the scary heights below. Next we got on the Chicago Trolley & Double Decker for a scenic drive around the city. While you can definitely get everywhere on the train and bus with your CTA card I recommend at least a 1 day Hop-On Hop-Off bus tour. This way you’ll see the great views from the top deck of the bus. Chicago is known for its architecture and you’ll miss it being underground on the train. Plus there is live commentary, which gives you a lot of information about Chicago and the different buildings. We got off the Chicago Trolley & Double Decker at museum row and visited Adler Planetarium. It’s included in the Chicago CityPASS and again includes VIP entry as well as access to all the shows and the entire planetarium. The kids enjoyed launching their own virtual rocket ships and learning about the constellations in the 360 dome. There are a ton of cool exhibits and the girls loved stepping on the scale to learn their moon weight. Next we headed to the Field Museum. Jordyn recently learned about dinosaurs in school so we were so excited to take her to the Dinosaur exhibit. 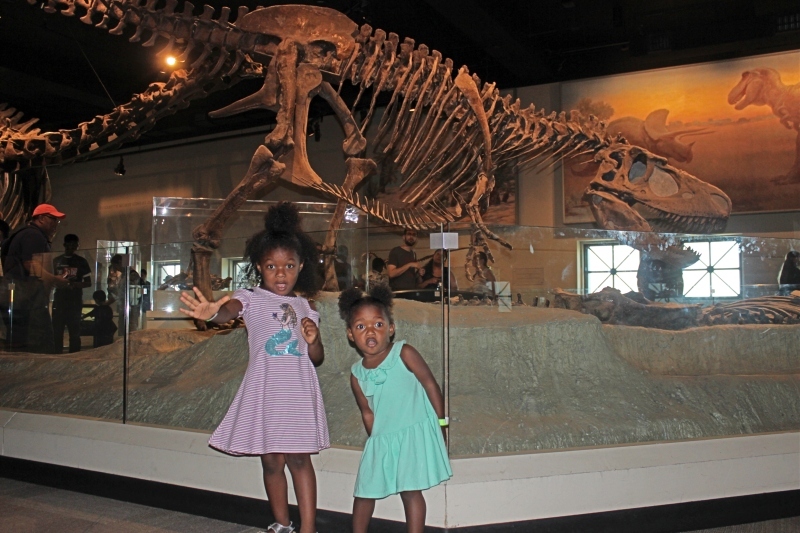 Both the girls loved seeing all the fossils and Kennedy kept yelling out “oh my God, dinosaurs wow”!! After seeing the dinosaurs we check out the Mummy exhibit. Maybe a little gory for the girls because they kept shouting, “why is the mummy dead?” but it was actually an amazing exhibit. Both the hubby and I learned so much, I for one had no clue Peruvians also mummified their dead and they provided a lot of history on that. Unfortunately we weren’t able to check out the Shedd Aquarium, which is right next door. The tickets are included in the Chicago CityPASS but because of the Memorial Day Parade taking place it took us two hours to get from 360 Chicago to the Planetarium and it killed a lot of our time. We did visit the Shedd Aquarium on our last visit to Chicago in 2015 and Jordyn loved it. I was bummed because they just opened their Underwater Beauty exhibit and really wanted to check it out. 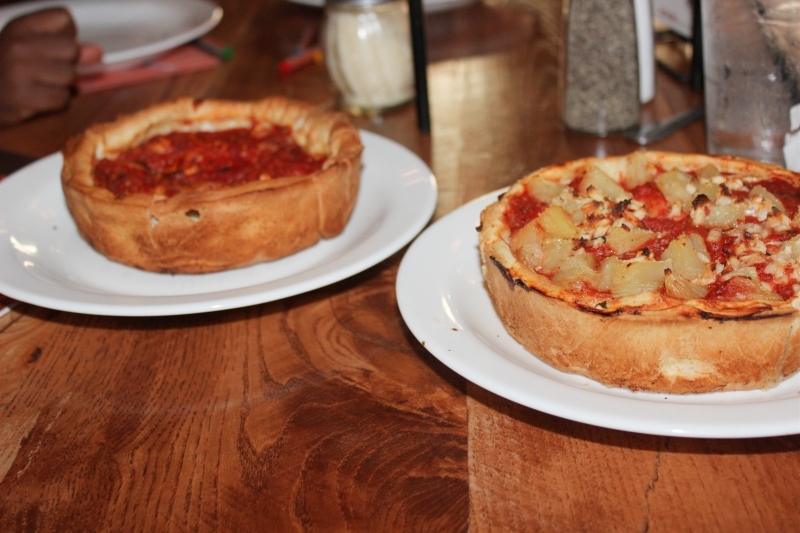 Chicago is known for it’s deep-dish pizza so we had to try some as soon as possible. First up was Giordano’s which our hop-on hop-off bus driver said was his favorite. Listen to me, make a reservation; we were so glad we did! We got their at 6PM, thinking we would beat the crowd but the couple in front of us who didn’t have a reservation got hit with an hour wait time. We each ordered a personal pizza since we wanted different toppings. Did you even visit Chicago is you didn’t make a stop at Garrett’s Popcorn? Instagram poll says no! Just be prepared to give Garrett’s all your coins, their popcorn is so good. We tried a little bit of them all and went home with 3 tins, 2 petites for the girls and a big one we need to share with someone else so we don’t finish it all in a day. My personal favorites are the caramel crisp and kettle corn, Kennedy loved the CheeseCorn flavor. Thanks to the lovely recommendations of our Instagram followers we headed to Batter & Berries for breakfast. They do not accept reservations so get there right when they open at 8AM or prepare to wait 50 minutes like we did. It was worth the wait (insert multiple hand claps, lol). 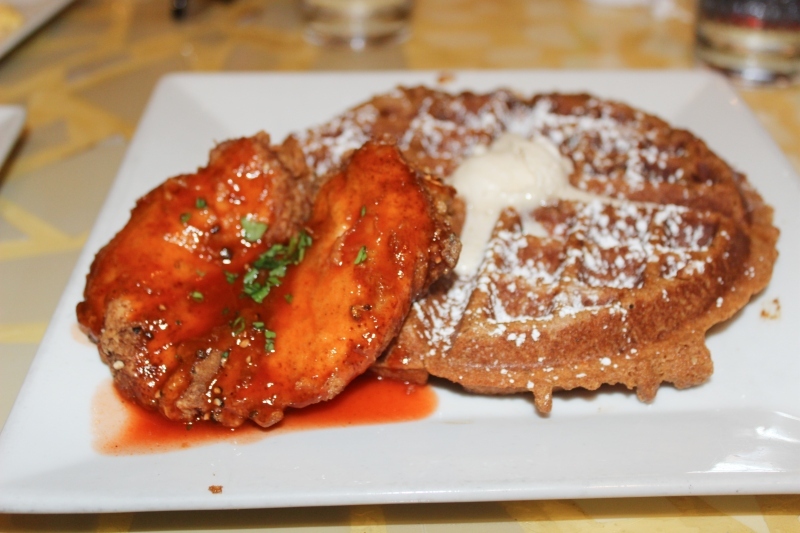 Just look at this food, the chicken & waffles or Cluck-N-Gaurfre as they call it has chicken IN the waffle as well as on top. 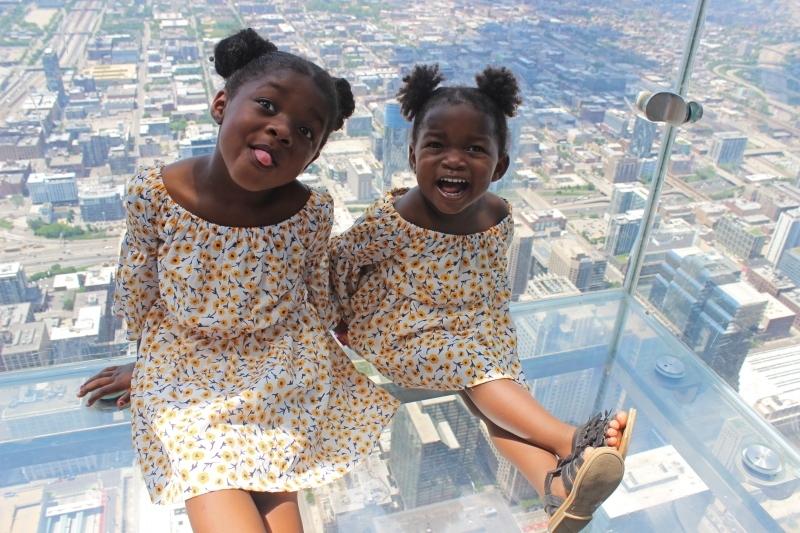 We headed to Skydeck Chicago next and were so happy we had the Chicago CityPASS. When we arrived the wait time for regular guests was 3 hours! There is no way we would have waited in that line. Thankfully with the we were able to skip the line. Just look at this line of people we passed right on by. Once inside you have great views of the city but really everyone is here to take pictures on The Ledge and so did we. There are 3 ledges that you can take pictures on. The one on the left (ask someone in case it changes) is operated by Skydeck. They have a professional photographer who takes your photo. You will be the only one on The Ledge so you can pose anyway you want to and not worry about others. The other two ledges each have 3 lines so when you go on The Ledge you’ll have other people on there with you. You’ll just has a small area to take pictures and it can feel a little rushed. Most people behind you won’t have an issue taking your photo, just ask. Are we the only ones who eat more on vacation than at home? Chicago has amazing food and we were here to indulge. 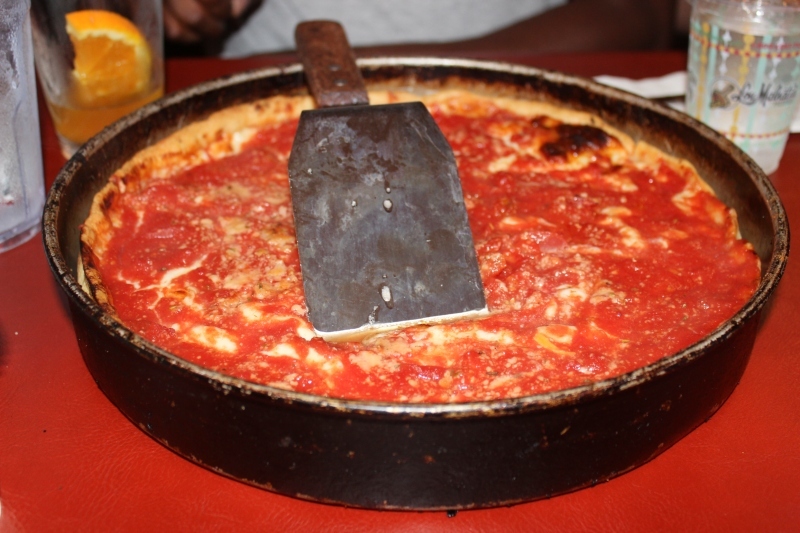 There is no way you can go to Chicago and just try deep-dish pizza from one restaurant. Next up was Lou Malnatis and while they don’t take reservations they do allow you to order your pizza, which takes 45mins to bake while you wait for your table. The four of us shared a medium pizza and we ate every bite! It was so good, do not leave Chicago without dining here. It was still very early so we headed to the Navy Pier. I had no idea they had a little splash pad or I would have brought our swimsuits. It was 90 degrees out and hot as ever and I’m sure the girls could have used the cool down. Don’t forget to pack yours, there were adults in there too! The Navy Pier is a great spot to hang out with tons of restaurants, rides, and where most of the boat tours depart from. 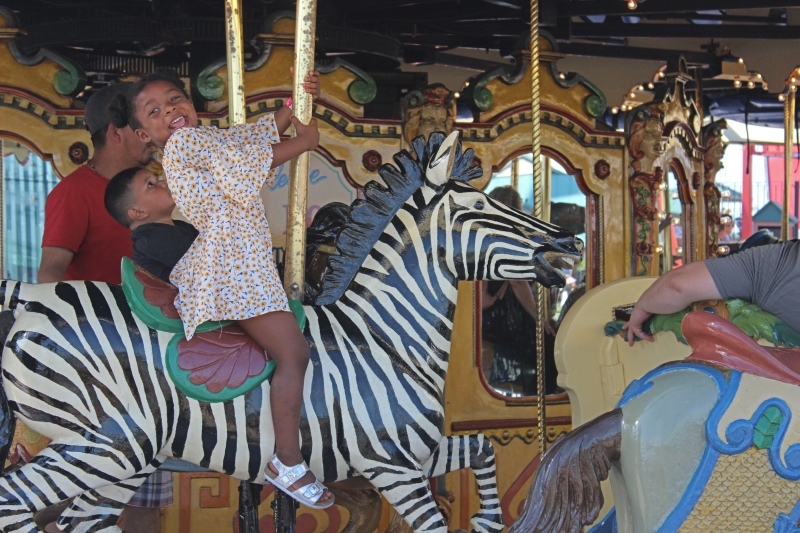 Of course the girls wanted to go on the carousel, it’s a little pricey at $9 for the both of them but could I really say no? We didn’t ride the Centennial Wheel because I drew the line at $18/pp for a ferris wheel and being scared of heights made this an easy decision. The Navy Pier has great views of the city, you can really admire Chicago’s architecture from here. There are a lot of restaurants at the Navy Pier so don’t worry about getting hungry here. From Memorial Day to Labor Day the pier also has free fireworks every Saturday night! Sidenote, Kennedy is such a daddy’s girl!!! The Cubs were in town and we really wanted to take the girls to the game but we were tired and opted to relax at the hotel. If there is a baseball, football, or basketball game while you’re visiting it’s a great way to experience the city. 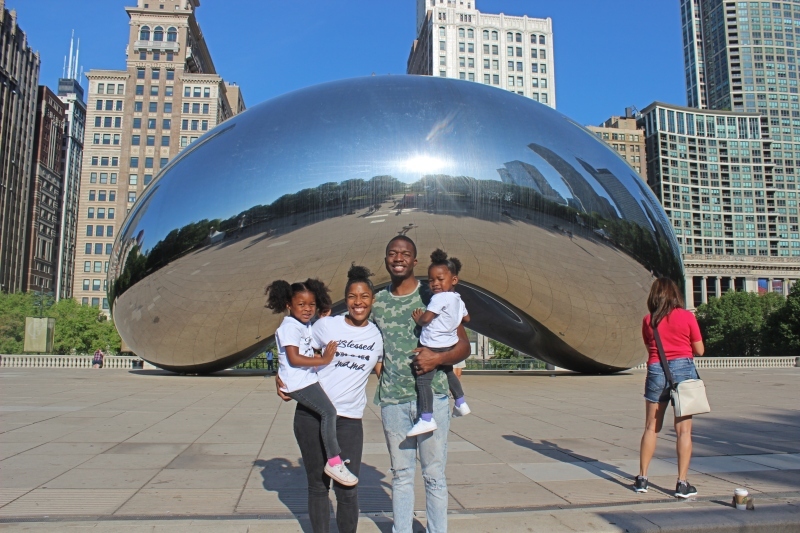 It was our last day in Chicago and there was no way we could leave without visiting Millennium Park and Cloud Gate, better known as The Bean. We got up early to arrive by 7:30AM to beat the crowds and it was so worth it. There we only a few people there and we were able to really enjoy it and get some nice pictures with barely anyone in the background. 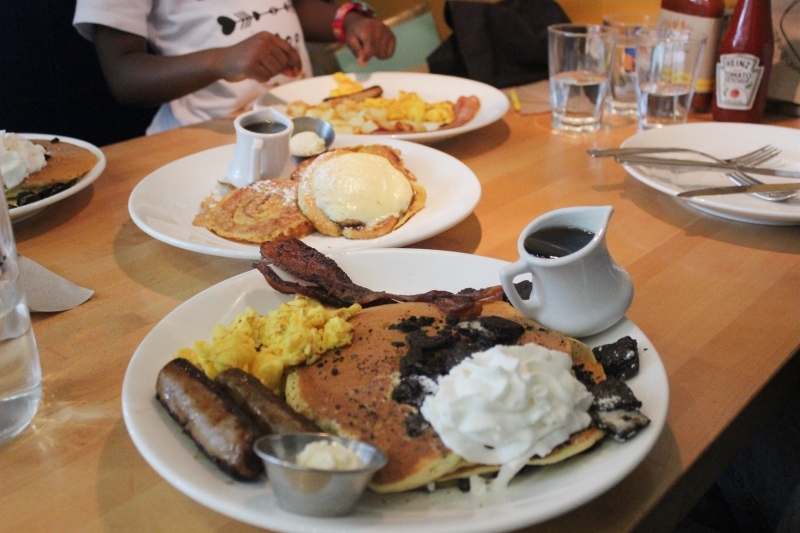 We went to eat breakfast afterwards at Yolk, it’s about a 10-15 minute walk. When we visited Chicago 3 years ago we ate here as well and loved it so we had to return. Like last time it did not disappoint. If you have a sweet tooth this place is for you, from Oreo to s’more pancakes and cinnamon roll to red velvet french toast your options are endless. 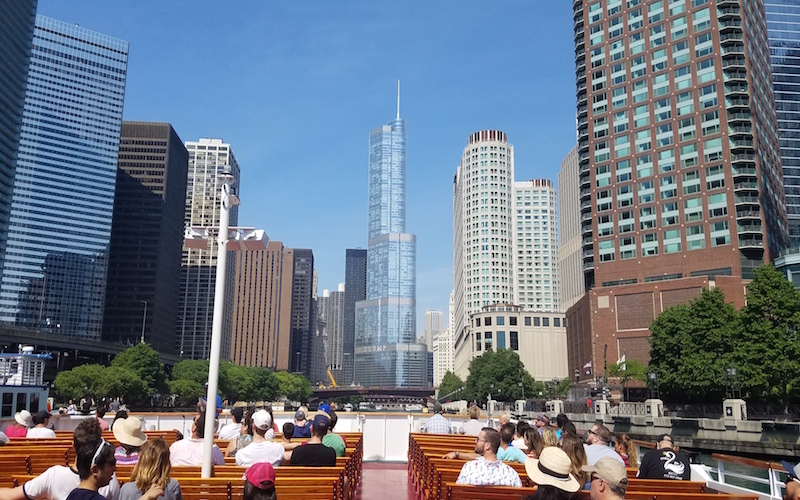 Chicago is famous for it’s architecture so if you’re into it you can’t miss the Shoreline Sightseeing Architecture tour. It takes you on a 75-minute information ride down the river and if you are lucky enough to get Victor as your tour guide you are in for an amazing tour. As many skyscrapers as Chicago has they are still adding more buildings and it was amazing to see the difference of the skyline from this trip to our last. We were heading home today and since we got up pretty early we went back to our hotel and relaxed a bit. We couldn’t leave without having one last meal and since we didn’t want to go far we ate across the street at Southern Cut Barbecue. Now my Instagram poll was 50/50 on whether or not Chicago could get Southern BBQ right but I have to give Southern Cut BBQ some credit because our meal was quite good. 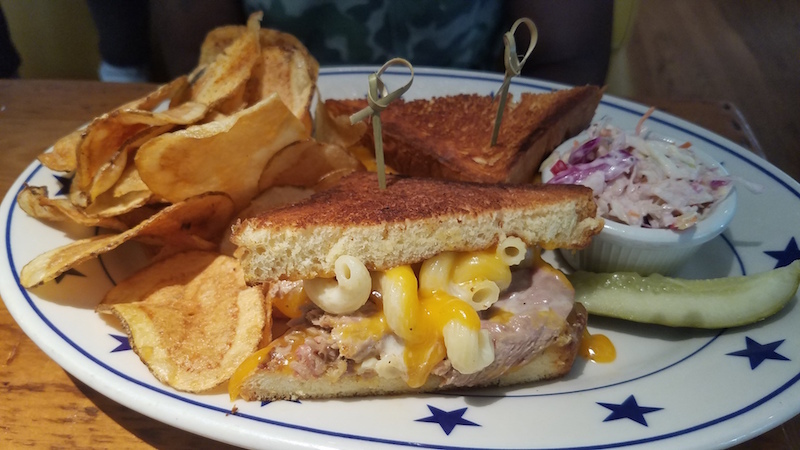 I got the pulled chicken sandwich, hubby got the Mac Daddy, and the kids shared the mac and cheese. We had a great time spending 3 days in Chicago. 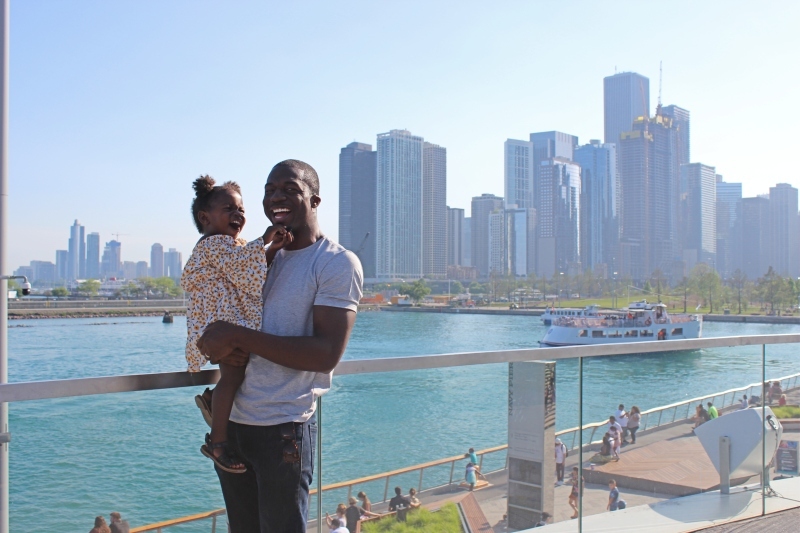 We hope you learned the best things to do in Chicago with kids, the best places to eat in Chicago, especially where to get best deep dish pizza in Chicago, and how to save money in Chicago. Chicago with kids is a lot of fun and we hope to return soon! 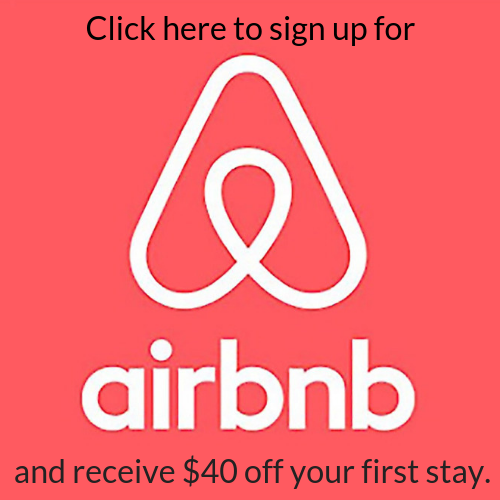 Did you find this helpful in planning your trip to Chicago? Please share it! Thank you to Raffaello Hotel and CityPASS for providing complimentary hotel stay and CityPASSes for our trip. All opinions are our own and true!